Eric Pevzner MPH PhD leads the CDC's Epidemic Intelligence Service (EIS), which has strong ties to Rollins. Many alumni and faculty have EIS on their resumes, and students have opportunities to work with the program. When Dr. Eric Pevzner was an MPH student in the late 1990s, one of his favorite courses was an epidemiology seminar that met every Tuesday morning down the street from Rollins School of Public Health at the Centers for Disease Control and Prevention (CDC). One week he might hear about a rash of unexplained hospitalizations in a rural town. The next he might listen to a discussion about the spread of a new disease in a remote region of Africa. And the next he could hear about response efforts to a catastrophic hurricane. Pevzner was listening to the reports of the CDC’s Epidemic Intelligence Service (EIS) officers—the agency’s elite disease detectives. The officers in the two-year postgraduate fellowship are deployed to investigate disease outbreaks or natural disasters, knocking on doors, interviewing people, gathering and analyzing data to get to the bottom of the incidents. They work in anonymity—their names don’t make the headlines, but they are the first responders to the outbreaks that do. Pevzner never lost his enthusiasm for the EIS program. Following his PhD, he went on to become an EIS officer in the Class of 2005. (The EIS identifies its classes by the year in which fellows enter, not graduate.) Then in June 2017, he assumed the helm as chief of the EIS program. In many ways, Pevzner personifies the close ties between Rollins and the EIS program. Like Pevzner, many Rollins alumni go on to become EIS officers. Some of Rollins’ most well-known faculty have EIS posts on their CVs. MPH and PhD students have several options to work with the EIS program during their Rollins years. And new EIS officers spend their first four weeks in the program in Rollins classrooms taught in part by Rollins faculty. “One of the things that makes Rollins unique is its extremely close connection with the CDC, and with the EIS program,” says Pevzner, who also serves as adjunct professor in the department of behavioral sciences and health education. Each year, 500 to 600 professionals apply for between 60 to 80 positions in the EIS program. Rollins and Emory alumni claim a disproportionate number of slots. Between 2009 (the first year the EIS program began tracking the schools from which its officers came) and 2015, 70 of the 566 EIS officers who went through the program had an Emory degree under their belt. Of the 149 officers currently serving, 28 have at least one degree from Emory. Perhaps all these Rollins alumni are drawn to the program because they’ve been taught by former EIS officers. To name but a few, Dr. Philip Brachman, Class of 1954, served as the second chief of the EIS from 1970 to 1981 and became a recognized anthrax expert during his time as an EIS officer. Brachman taught at Rollins until he passed away in 2016. Dr. Eugene Gangarosa, Class of 1964, founded the Rollins Center for Global Safe WASH. Dr. John McGowan Jr. was in the Class of 1969, and his daughter, Angie McGowan, was in the Class of 2002. Current faculty members with an EIS history include Drs. Ruth Berkelman, Patrick Sullivan, Scott McNabb, and Godfrey Oakley. Dean James Curran was named an honorary member of the Class of 2004 (and his daughter, Katie Curran, was in the Class of 2014). The list goes on. Rollins students also have several opportunities to work directly with the EIS program. Through the Student Outreach and Response Team (SORT), students can help EIS officers with their disease response. During the Ebola outbreak, 45 SORT volunteers helped update the spotty maps of the affected areas with critical details such as exact locations of villages, roads, and buildings so responders could better direct their efforts. Students in the Rollins Earn and Learn (REAL) program can get posts with the EIS program. In this capacity, they might help with efforts to recruit EIS officers, plan and implement the annual EIS conference, and track outbreak investigations. “The Rollins REAL students contribute in many roles that allow this program to function as it does,” says Pevzner. Rollins alumni who go on to become EIS officers will find themselves back in familiar territory. Each new class starts with a four-week course—sort of an epi boot camp—which is held on the Rollins campus. Three epidemiology professors—Drs. Patrick Sullivan, Michael Goodman, and Jodie Guest—teach some of the didactic portion of the course. “The fact that we have faculty who are doing cutting-edge epidemiological research to provide that level of teaching to our officers is a tremendous benefit to the program,” says Pevzner. Edwin Trevathan MD MPH is professor of pediatrics and neurology at Vanderbilt University School of Medicine and director of the Vanderbilt Institute for Global Health. Elise Beltrami MD MPH is associate director for Epidemiologic Science at the CDC’s National Center for Emerging and Zoonotic Infectious Diseases and a commissioned officer of the US Public Health Service. Yoran Grant-Greene MPH PhD is associate director for the West Africa region in the CDC’s Division of Global HIV and TB and a US Public Health Service officer. 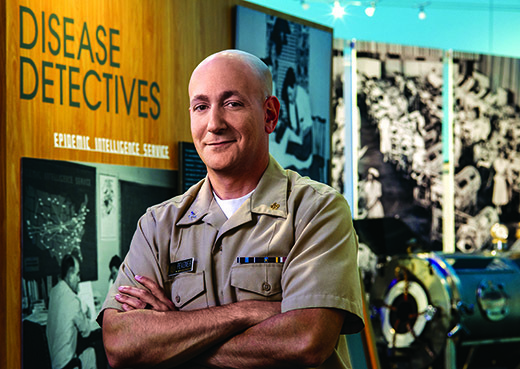 Anthony Fiore MD MPH is chief of the Epidemiology Research and Innovations Branch, Division of Healthcare Quality Promotion, at the CDC’s National Center for Emerging and Zoonotic Infectious Diseases. Michael Martin MD MPH is senior technical adviser in the Division of Global HIV and TB at CDC Ukraine and a commissioned officer of the US Public Health Service. Umesh Parashar MD MPH is chief of the Viral Gastroenteritis Branch in the CDC’s Division of Viral Diseases. Alexander Crosby MD MPH is senior medical adviser in the Division of Violence Prevention in the CDC’s Center for Injury Prevention and Control. Rebecca Levine MPH PhD is senior research scientist at the CDC.